Cadence's unique VCAD engagement model has been executed with more than 100 customers worldwide. 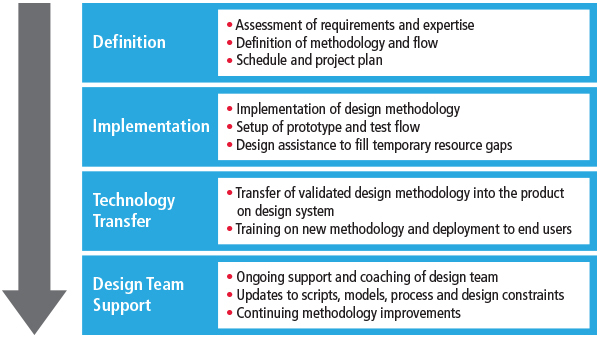 It enables them to access a flexible pool of experts providing the desired type of services for their design and productivity challenges. The typical VCAD engagement is a long-term collaboration tailored to your needs, whether you're at a small startup company or a corporation with a large number of engineers located in multiple sites worldwide. Central to Cadence VCAD services are our engineering teams with their specialized design and methodology expertise (aligned with the Cadence technology platforms) and their focus on productivity. To increase efficiency and meet expectations towards quality and maintainability, Cadence has developed productivity IP core application packages based on the most common customer demand for automation and productivity increase. By applying these pre-existing core applications and customizing them to meet system requirements, our VCAD engineers help your design teams ramp up quickly and be more productive. Our secure VCAD collaboration infrastructure enables Cadence technology experts to work closely with your design team, regardless of location. Using this infrastructure, our engineering teams become part of your development team and share their technical know-how. 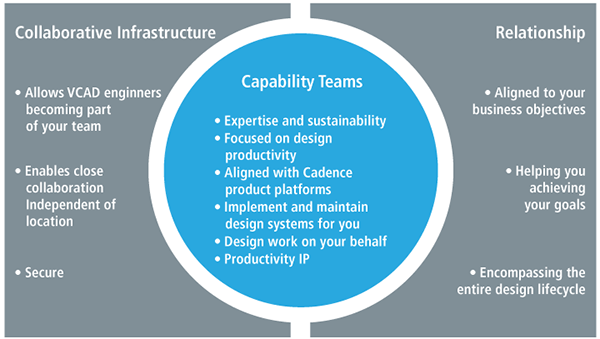 In contrast to the otherwise transactional character of the services business, Cadence VCAD services encompass the entire design lifecycle to align with your business objectives.